Imagine you are on the 9th hole, it’s hot outside, you are hungry and all you want is a small snack. You reach into your golf bag and the snack bar you brought is melted and now you are hungry and messy. How about for the ladies when you want to reapply your lipstick before heading to the club house but your lipstick is completely melted and now it’s all over your golf bag? At one time or another we have all been a victim to the heating and melting power of the all mighty sun. Well one company decided to fight back with a great product called the Cool-It Caddy. The Cool-it Caddy™ concept came about when founder, Deborah Vinci, was golfing in the summer heat and went to re-apply a lip protective product only to have a large chunk come off onto her lips. 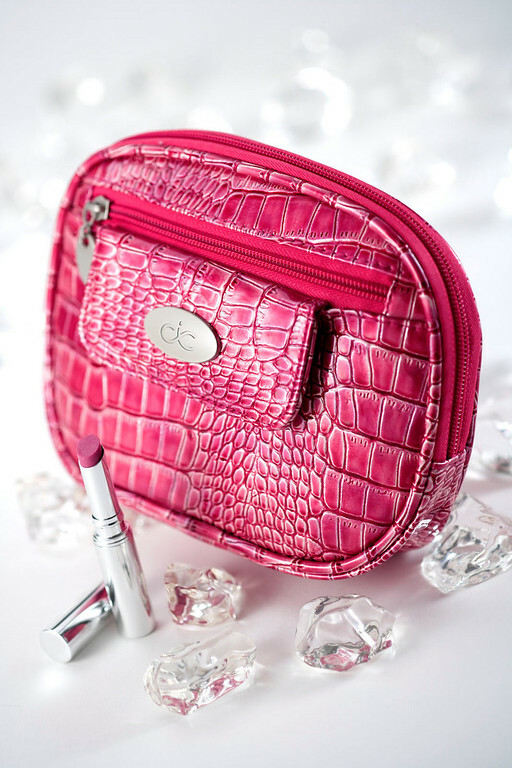 Deborah questioned why there was not a product on the market that she could put her lipstick into and have it protected and also be able to conveniently throw it into her purse or golf bag. She then began the process of designing a bag that outdoor enthusiasts could use to safely store heat sensitive products (cosmetics, health care items, protein bars, etc). Vinci Designs, LLC is happy to introduce your answer to “heat meltdown” with our patent pending Cool-it Caddy™. The concept behind the Cool-It-Caddy is great! 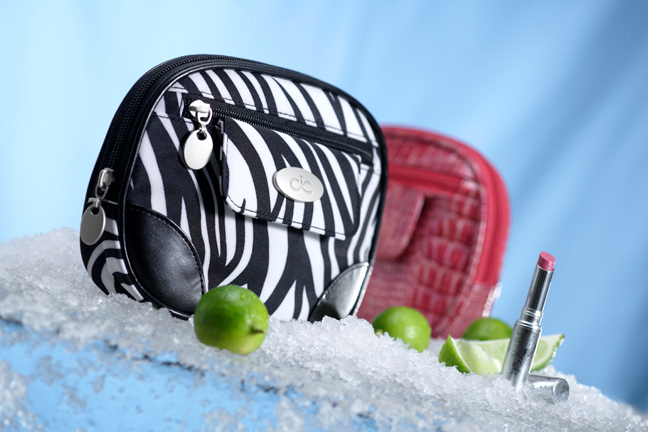 It’s like having a fashionable lunch box/cooler/purse that you can take with you just about anywhere. I want to start by talking about the design of the bag. The first thing I noticed based strictly on looks is that the bag is very cute, quite fashionable, and could easily be confused with an everyday or even evening clutch. I live in an area where there are a lot of senior players and they just loved the zebra print. 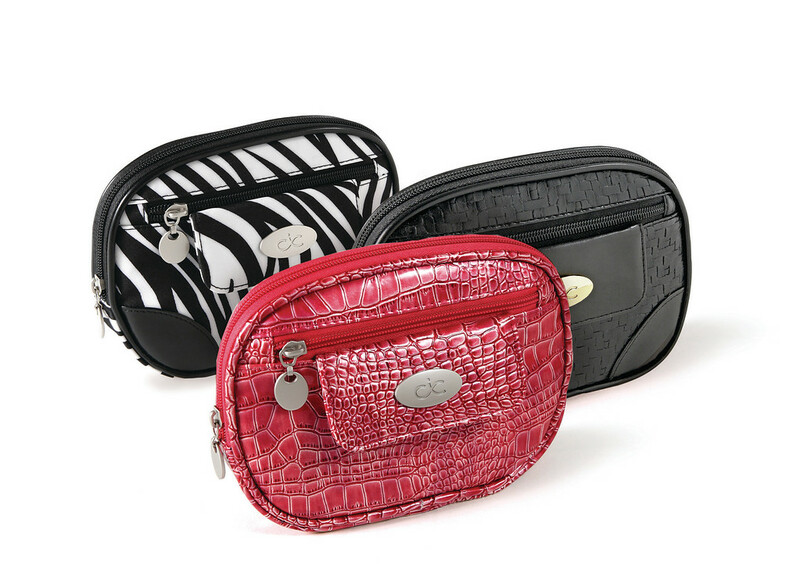 The zebra bag is made of a micro fiber material and the pink and black ones are more of a faux crocodile skin. Each bag has a main compartment for your larger items, smaller zipper space in front, and a snap compartment in the back. On top of all the storage they also come with a built in mirror which I thought was a wonderful extra touch. The bags seem to be very well made, the stitching, construction, and durability are all very strong. When you first pick up the bag they seem quite heavy, all the testers were a little surprised at first. The added weight comes from the built in coolant, so while it was a little weird no one seemed to mind if the product worked. When the bags arrived at my office I was given instructions to place a small rag or washcloth inside each Cool-It-Caddy and place in the freezer so that is exactly what I did. The cooling mechanism is built into the bag so you never have to worry about stuffing it with ice packs or losing them and having to buy new ones. The wash cloth is to help the be more pliable after being frozen and it seemed to work just fine. I left them in the freezer over night and then took them to the course and had the women in the weekly ladies league give them a try. The ladies stuffed these babies full of chapstick, lipstick, energy bars, candy bars, and medicine. I informed them that the Cool-It-Caddy is to be placed inside their golf bag and that if it works properly their items should stay cool through the entire round, even in the 80 degree weather we were having even though it’s December (gotta love that Florida weather!). I met with them again after their round to get their feedback. The overall response was great. I was told no lipstick or chap stick melted, there was no chocolate all over their hands, and their medicine stayed nice and cool. The ladies loved the concept behind the bag but they did have a few critiques. They would have liked to see the bag a little bigger to be able to fit a piece of fruit such as an apple or banana. I have mixed feelings on that because on while I agree that it would be great to be able to bite into a cold apple on the at the turn if the bag any bigger it might be too bulky. The million dollar question I had for all the ladies was “would you buy this bag and use it on a regular basis?” I am happy to report that 80% of the ladies said, without hesitation, yes. That 80% said that they saw so many great uses for the Cool-It-Caddy. It is not just a golf accessory it can be used for just about any outdoor activity and they could see themselves using it for a night on the town as well. The 20% that said no or who were still on the fence all felt that this is a great concept and they thought the bag worked quite well, but even with the different compartments it was still lacking some additional storage space. They also thought the Cool-It-Caddy was a little too clunky and took up too much space in their golf bag. For me personally I did not feel that it took up too much space, it slipped right into my bag with no issues. Overall the majority of ladies really liked the Cool-It-Caddy and could see themselves using this for all their rounds. The age group tested ranged from 25-75 and they are all very fashion conscious ladies so I was pleased to hear their positive feedback on the appearance of the Cool-It-Caddy. As of right now you can purchase this product in one of three color/pattern styles and they retail for $39.95. You can purchase them from their website here. Sounds like what this back needs is a clip to hang it on the outside of the golf bag. Overall, a good addition to the golf accessory lineup! I thought the same thing but when I spoke to the people at Cool-It-Caddy they said they did not put a clip on the bag because it is meant to stay inside your golf bag and away from the sun. I personally didn’t have an issue with it taking up space in my golf bag. The dimensions are 7.5″x5.5″x2.5″. I really like the idea of this, but would prefer a rectangular shape over the oval. I’d also like to clip it onto my bag for easy access. It’s a little on the pricey side for a small cooler imo. I know it’s for the ladies, but if it’s designed to go inside of the bag and not really be seen much, there has to be cheaper alternatives.